Learn about the impact of palm oil on orangutans. Is sustainable palm oil better? Palm oil, an ingredient found in many everyday food and cosmetic products, is contributing to the rapid deforestation in Sumatra. Orangutan habitat in Sumatra and Borneo is being cleared at an alarming rate for conversion to oil palm plantations. On Sumatra there is now more than 4 times as much land cultivated with oil palms as there is orangutan habitat remaining. Over the past few decades, oil palm plantations have rapidly spread across Southeast Asia and the palm oil industry has become a crucial source of income and employment for countries such as Indonesia. However, this development has come at the expense of Indonesia’s tropical rainforests and peatlands, home to countless endangered species and providing crucial ecological services to millions of people. 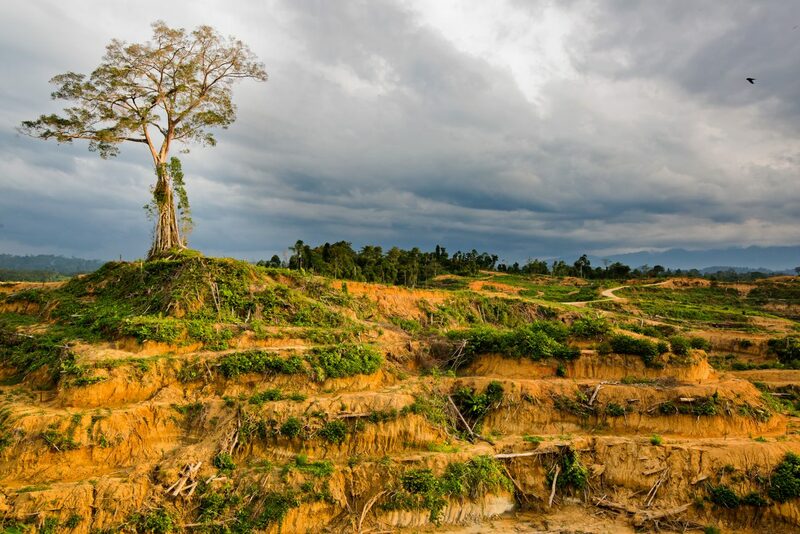 There is a huge amount of degraded land available for planting oil palms in Sumatra and Borneo, but palm oil companies can make a quick profit when they cut down rainforests and sell the timber, so the relentless deforestation continues. Palm oil production is having catastrophic environmental and social impacts across Southeast Asia, Latin America and Africa. Indonesia is the world’s biggest producer of palm oil, and there are more than 4 million hectares of plantations in Sumatra alone – an area the size of Switzerland. Much of this development has come at the expense of rainforests, including vast swathes of orangutan habitat. As one of the primary drivers of deforestation in Sumatra, the palm oil industry poses a serious threat to the survival of orangutans, as well as countless other endemic and critically endangered species including the Sumatran tiger, Sumatran rhinoceros and Sumatran elephant, that share the same rainforest habitat. As plantations expand, populations plummet, and incidences of human-wildlife conflict escalate. As the global demand for palm oil has increased, so has the extent of land under oil palm cultivation. Between 1989 and 2000 the area covered by oil palms in Indonesia more than tripled, and the country now has over 6 million hectares of oil palm plantations. There are more than 15 million hectares of oil palm plantations worldwide. Much of this expansion has been at the expense of lowland rainforests – some of the most species-rich areas on earth. Current plans to lift protection from the Leuser Ecosystem in Sumatra are one of the biggest threats to biodiversity on the planet, threatening the very existence of the critically endangered populations of Sumatran orangutan, rhino, elephant and tiger. Oil palm plantations can have a major impact on global greenhouse gas emissions, especially when they are established on land converted from peat swamp forests, which release huge amounts of carbon dioxide and methane when they are cleared. Should we boycott palm oil? Will this action help orangutans, forests, and communities? If the international market for palm oil disappears, corporations and smallholder farmers alike could switch to producing an alternative crop. Oil palms are the most productive oil crop in the world, which means that a switch to another type of edible vegetable oil (such as soybean oil) would require up to ten times as much land to produce the same yield. This would lead to more deforestation, not less. Boycotting palm oil could also drive the price of the oil down, making it more attractive for biofuels and livestock feed. This could increase demand, especially in countries such as China and India, which import the largest amounts of palm oil. All agriculture has an impact, and with over 4.5 million people in Indonesia alone relying on the palm oil industry as their primary source of income, palm oil is here to stay. What we need to do is ensure that it is cultivated in the least damaging way possible. Palm oil trees do not need to be grown at the expense of forests. Instead, we need to demand an end to deforestation to ensure safe habitat for orangutans and all the other species that also rely on the rainforest. As the debate about whether ‘sustainable’ palm oil is an oxymoron continues to rage, forests continue to fall. The situation in Sumatra is desperate, but it is not without hope. As well as reclaiming and restoring forests, we are working hard, alongside our NGO and private sector colleagues, to break the link between development and deforestation, thereby ensuring that forests are kept safe from the bulldozers and chainsaws. This means finding ways for the locals to improve their income without chopping down rainforest trees. Who are the RSPO and can they be trusted? SOS is an active member of the Roundtable on Sustainable Palm Oil (RSPO), an organisation which brings together companies that produce, trade, use or invest in palm oil, alongside conservation and social NGOs. We have been working for many years, alongside partners, to strengthen the RSPO standard, and just this week (November 2018) the RSPO has launched a new, improved version of this standard, which will deliver deforestation-free palm oil. Until companies’ palm oil production is certified according to the new standard, we advocate the production and use of responsible palm oil produced according to the Palm Oil Innovation Group (POIG) Charter. POIG is a collection of NGOs and progressive palm oil producers that have established a detailed set of values that build on the RSPO standard and stipulate that palm oil operations must be free from deforestation, destruction of peatlands, and human rights abuses. It is crucial that companies who commit to clean up their supply chain turn this aspiration into action. Deforestation-free palm oil needs to be a reality for all. We need palm oil producers to stop converting forests and peatlands to palm oil plantations. Instead, they could use degraded land or increase yields on existing plantations. They also need to be transparent about their production methods and avoid labour, land and human rights violations. Companies selling products made with palm oil and its derivatives need to source responsibly-produced palm oil, ensuring their supply chain is traceable, and communicating honestly with their customers about their progress on the journey to using solely responsible palm oil. As a consumer, you can research which retailers and manufacturers are committed to removing deforestation from their products (check out a fantastic bar-code scanning app called Giki! 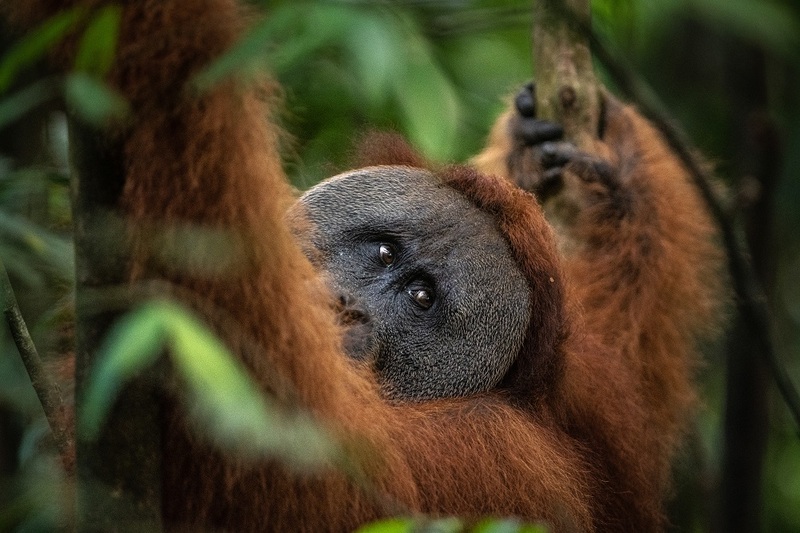 ), join social media campaigns to drive the industry in the right direction, and support conservation organisations who are working to break the link between palm oil and deforestation. Environmentally-sensitive land use planning, increasing yields on existing plantations, and environmentally and socially responsible investment and purchasing, are all crucial to break the link between palm oil and deforestation, and save the Sumatran orangutan from extinction. 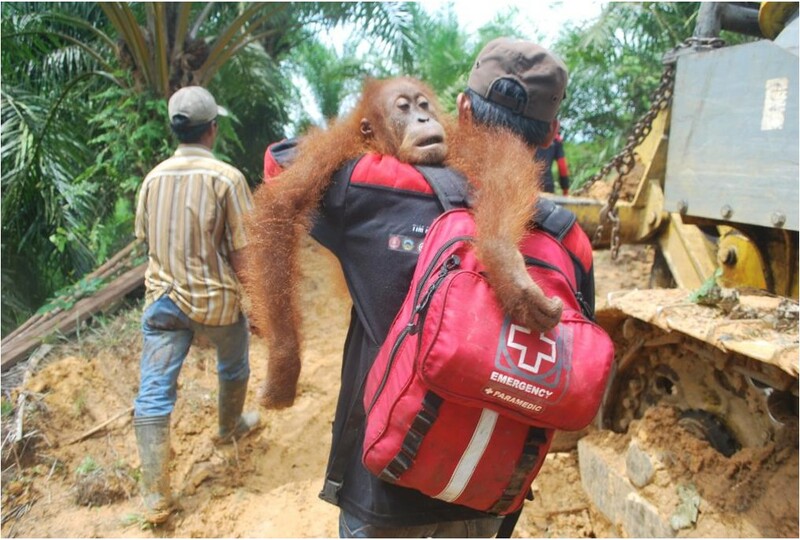 SOS works to secure the future of Sumatran orangutans and their forests. We support frontline conservation programmes and campaign on issues threatening the survival of orangutans in the wild. Our projects include rainforest restoration and developing community-led conservation initiatives which support the protection of the rainforests, empowering local people to become guardians of this precious ecosystem. Through our membership of the RSPO and POIG, and our active involvement in frontline conservation projects in Sumatra and international campaigns, SOS is working to break the link between palm oil and deforestation. This is only possible thanks to our donors and supporters. Please support SOS so that we can continue to fight for Sumatran orangutans and their forests.